Full face snorkeling masks haven’t been around for that long compared to the classic versions, but they are already becoming a favorite among novice and experienced divers alike. It shouldn’t really come as a surprise to anyone, as full face masks come with a number of benefits that their traditional counterparts simply cannot offer. Things like improved vision and enhanced protection are immediately obvious, however, that’s merely scratching the surface when it comes to what these types of masks can bring to the table. If you have questions that you’d like answered right away, just click on the contents table below, otherwise, join us as we explore the benefits of full face snorkel masks for children. Can Children Use Full Face Snorkeling Masks? Are Full Face Snorkeling Masks Safe for Children? There is an increasingly high number of full face snorkeling masks available on the market and they each come with their own pros and cons. Despite these differences, however, you’ll find that all full face masks share certain traits that are not available on regular masks. Just as their name suggests, these types of masks cover the whole face, as opposed to the older variants which only cover parts of it. This makes them a lot more convenient and practical as the users don’t have to hold on to a mouthpiece while submerged. Holding on to the mouthpiece of regular masks can often lead to a sore jaw during long diving sessions, which isn’t the case with the full face models. Children usually also experience problems when trying to use a mouthpiece while snorkeling. Another important aspect to note is that full face snorkeling masks allow users to breathe more freely and include safety features that prevent water from entering the snorkel. Not only that but these masks also offer much better visibility underwater and prevent fogging. 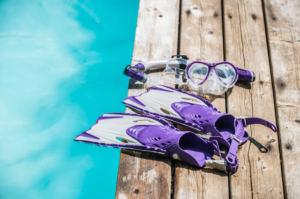 In addition, snorkelers can expect a better degree of protection with these masks not just because they offer more face coverage but also because they tend to be made out of stronger materials. These types of masks are available in various sizes and come equipped with adjustable straps. This makes them suitable for everyone, especially children. But while kids can most certainly use full face snorkeling masks, it’s the parent’s job to pick a mask that is the correct size for their child. While it is important for adults, it’s much more important to pay attention to safety when snorkeling with kids. The products work as intended only as long as they are perfectly sealed so it’s a good idea to adjust the straps yourself and make sure everything fits perfectly on your child’s face. Check out this step by step video where a mother explains how easy it is to fit a full face snorkel mask on your child. Well, simply put, yes. Children’s full face snorkeling masks are very safe and usually tend to include several features aimed at guaranteeing that water won’t get anywhere near the wearer’s mouth or nose. Assuming the mask is in perfect condition, the silicone seal lining it is actually more than enough to keep the water out by itself. But again, parents should always make sure that the mask is properly placed on their child’s face before a snorkeling session. As long as the mask is sealed, you can expect your child to be 100% safe while underwater. In fact, these types of masks are generally much safer for children than regular ones. Dry Top System: This is an extremely simple yet very ingenious system that prevents water from entering the snorkel. It mainly consists of a float that’s located inside the snorkel and blocks the entrance if it happens to get submerged. If water does somehow manage to get it, a valve located at the bottom will automatically drain all of it once the wearer’s head resurfaces. Mouth and Nose Breathing: A major advantage of full face masks is the ability to breathe both through the mouth and the nose. Unlike regular masks, full face ones don’t have a mouthpiece and feature a separate breathing chamber. Even if water does somehow enter the mask, it won’t be able to reach the mouth or nose. Nowadays, there is a huge variety of full face snorkeling masks available on the market. As with any product, some are better than others not only in terms of features and reliability but also in terms of their bang for the buck. There are many things to take into consideration when looking into a full face snorkeling mask for your children, but for the most part, you’ll probably want to go with one of the ones listed below as they are currently the best masks available out there. 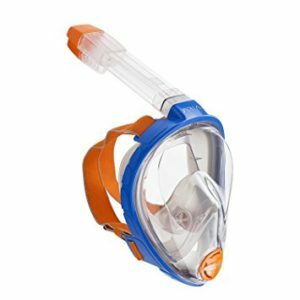 If you’re looking for a very reliable and fairly priced full face snorkeling mask for your child, you’ll be hard-pressed to find something better than the WildHorn Seaview 180°. This model has pretty much everything you’ll ever need, including three different sizes and ten different colors to choose from. The name of this mask is very appropriate as the WildHorn Seaview does indeed provide the wearer with a 180° field of vision. This is all thanks to the shatterproof polycarbonate flat lens that not only allows for maximum visibility but also offers enhanced protection. Children naturally would be more careless when handling the mask, so the harder something is to break, the better. The mask comes equipped with a silicone outlining and elasticized straps that combine to form a reliable waterproof seal around the wearer’s face. Meanwhile, the dry-top system will ensure that no water can enter the snorkel even when it’s completely submerged. WildHorn Seaview 180° features an improved anti-fogging system compared to similar models. It’s always possible that some fogging may occur regardless of the model but with this mask, you can expect it to disappear as fast as it appeared. Another big advantage of this mask is that it comes equipped with a GoPro mount located in the forehead area. Even better, the mount is highly adjustable so you can be certain that the camera is always pointing where you want it to. A disadvantage of the adjustable mount is that it’s a bit more delicate than some of the other models you’ll come across. While there’s no risk of damaging the mount while adjusting it, you will need to take care while packing the mask for traveling. At only 1.35 lbs, the WildHorn Seaview 180° is a very light mask, which is generally a good thing but might be considered a drawback by some. Due to its lightweight, the mask is very buoyant so you can be sure that your head will always be kept afloat while wearing it. Now while this might sound as a down side for adults or more experienced snorkelers, it’s exactly what a child needs. What better place to fit a floating device if not on the head? All in all, the WildHorn Seaview 180° is arguably the best kid’s full face snorkeling mask you can buy right now. The mask is lightweight and sturdy while also being available at a very reasonable cost. In addition, the manufacturer offers a 1-year warranty along with a return policy. If you want to give something to a child to play with, the warranty comes in quite handy. 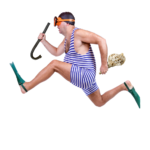 Tribord is often accredited with being the first company to popularize full face snorkeling masks as we now know them. The company continued to improve upon the original design over the years and is constantly trying to make further adjustments based on customer feedback in an attempt to create the perfect product. The EasyBreath is exclusively made out of hypoallergenic materials. This makes it a very good pick for people with sensitive skin or who suffer from certain skin conditions. Great field of vision thanks to the flat lens made out of shatterproof polycarbonate materials. The sturdy construction also makes the mask very durable. Includes a system that attempts to prevent fogging altogether. Unlike most masks that focus on getting rid of the fog as soon as it forms on the lens, the EasyBreath comes equipped with a system that prevents the mask from ever fogging up in the first place. Tribord designed this mask to be as sturdy as possible and it shows in every department, including the GoPro mount. The mask also features a clip-on system that makes it easy to replace various parts in case they get damaged. The sturdiness and anti-fogging solutions of the Tribord EasyBreath, however, come at a cost. This however is not the biggest downside. Unlike many of its competitors, the EasyBreath is only available in two sizes. This can cause problems if you are intending to buy a full face snorkel mask for children under the age of 6. The mask is a very solid option for those who travel a lot or those who want a mask that’s as sturdy as possible. When it comes to masks that are specifically aimed at children, however, there are much better options out there, like the WildHorn Seaview we mentioned above, as the Tribord EasyBreath does not come in the child-friendly XS size. The Aria is somewhere between the WildHorn Seaview and the Tribord EasyBreath in terms of its design and features. As such, it comes with many of their strengths but also some of their weaknesses. Similar to the EasyBreath, the lens is made out of organic shatterproof polycarbonate materials, which makes it ideal for those with sensitive skin. It comes with a somewhat improved version of the tried-and-true dry top system while also including a very effective bottom valve. Very useful for situations when water accidentally enters the mask as the wearer can quickly tilt their head to drain it out. The mask is sturdy and flexible while also including a handy storage bag. In terms of the GoPro mount, it borrows more from the EasyBreath than the WildHorn, which makes it very durable but not particularly flexible. The Aria features a separate breathing chamber so there will be very little fogging under normal circumstances. An interesting feature that sets the Aria apart is the presence of special holders located on the snorkel. These are meant to hold chemical lights in order to offer better visibility while snorkeling during sunset. This feature, although unexciting for adults, might just be the right thing for your kids! In its quest to offer more features than its competitors, the manufacturer came up with a solid but fairly expensive product. 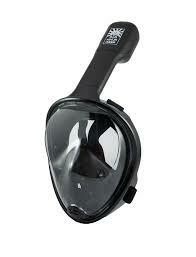 Hence, it’s a bit hard to recommend the Aria for anyone looking for an affordable full face snorkeling mask. Not the best option for those who want to use it along with a GoPro camera due to the mount’s lack of flexibility and the mask’s overall price. The Aria is a good pick for anyone not on a budget. There’s a decent number of features to enjoy here and the mask is also available in four sizes. A good mask for children but not really the best because of the high price and the fact that its unique features are mainly targeted at adults. If you are not on a budget, however, feel free to purchase this product, as reviews suggest it goes quite far for the price. Buying a full-face snorkeling mask for your kid means enabling them to enjoy this kind of adventure without any risk of injury or discomfort. Of course, this is only true if you buy a high-quality mask. Unfortunately, most such masks are pretty expensive, which is the reason why we created this article and recommended a couple of fairly affordable masks. Choose one of these and your kid won’t get disappointed! And remember, always snorkel safely!